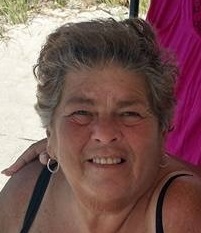 Margaret Anne (Pidge) DeCouto of Ft. Myers, FL, formerly of Quincy and Braintree, age 78, died February 19, 2019. Loving daughter of the late Bernard and Lillie Barrows; Loving mother of Susan Sampson and husband Scott of Plymouth, Kim Cleary and husband Kevin of Plymouth, Anne Smith-Yourell and husband Bucky of Ft. Myers, FL, and Anthony DeCouto and wife Kelly of Norwell; Loving sister of Bernard Barrows and wife Patricia of Quincy, Robert Barrows and wife Rosie of Braintree, and the late Peter Barrows; Loving grandmother of Dylan, Lilly, SSGT James, Jessica, Jacqlyn, Ryan, and Ava; Loving great grandmother of Jasmine, Derek, Logan, and Maverick. Pidgie grew up in Quincy and Braintree. She was a long time employee of Howard Johnson in Quincy and then became the general manager for Marriott/Sodexo food services. She enjoyed reading, gambling, shopping, going to the beach, and she especially loved to spoil her grandchildren and great grandchildren. A graveside service will be held Saturday April 20 at 11:30am at Village Cemetery, 339 Washington Street, Weymouth. In lieu of flowers donations can be made in memory of Margaret to the American Cancer Society.